The summary below is provided for educational purposes only. If you have any thoughts or would like to discuss any other matters, please feel free to contact me. 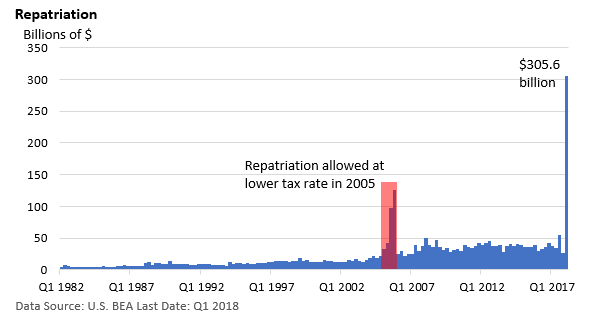 The recently passed tax bill requires that overseas corporate earnings, which have yet to returned to the U.S., be taxed at 15.5% if held as cash/cash equivalents, and 8% if illiquid assets. Estimates vary on how much is held outside the U.S.
Bank of America Merrill Lunch (BAML) believes $2.5 trillion has accumulated since 1986. A recent estimate in Fortune suggests $3.1 trillion has been locked up overseas. Why are the riches offshore? Prior to tax reform, companies were required to pay the 35% corporate rate on overseas earnings, even if already taxed by foreign governments. But the U.S. government allowed firms to defer paying taxes on offshore earnings until brought back— or “repatriated”— to the U.S.
Companies ultimately do what’s in their own best interest, and they left massive profits overseas. Recently released data from the U.S. BEA suggests a major shift is happening thanks to tax reform. In the first quarter of 2018, companies repatriated over $300 billion back into the U.S. It is an enormous amount of capital being injected into the U.S. economy. Some analysts see it as a major shot in the arm for economic growth; others aren’t so sure. A survey by BAML of 300 S&P 500 companies last year revealed various expected uses for repatriated cash: 65% plan to pay down debt, 46% plan to buy back their own stock, 42% for acquisitions of other companies, 35% on capital spending, 29% on dividends, 12% on pensions, and 25% miscellaneous categories (multiple answers allowed). Investment in new capital equipment would likely provide the biggest boost to the economy. Repayment of debt strengthens the balance sheet, while share repurchases and dividends may support investors. Going forward, most overseas earnings will not incur a U.S. tax, even if immediately brought home. That provision is likely to provide long-term benefits to the economy, though such benefits may be difficult to immediately quantity. It is important that you do not use this e-mail to request or authorize the purchase or sale of any security or commodity, or to request any other transactions. Any such request, orders or instructions will not be accepted and will not be processed. All items discussed in this report are for informational purposes only, are not advice of any kind, and are not intended as a solicitation to buy, hold, or sell any securities. Nothing contained herein constitutes tax, legal, insurance, or investment advice.Stocks and bonds and commodities are not FDIC insured and can fall in value, and any investment information, securities and commodities mentioned in this report may not be suitable for everyone. U.S. Treasury bonds and Treasury bills are guaranteed by the U.S. government and, if held to maturity, offer a fixed rate of return and guaranteed principal value. U.S. government bonds are issued and guaranteed as to the timely payment of principal and interest by the federal government. Treasury bills are certificates reflecting short-term (less than one year) obligations of the U.S. government. Past performance is not a guarantee of future performance. Different investments involve different degrees of risk, and there can be no assurance that the future performance of any investment, security, commodity or investment strategy that is referenced will be profitable or be suitable for your portfolio. The information has been obtained from sources considered to be reliable, but we do not guarantee that the foregoing material is accurate or complete. The information contained in this report does not purport to be a complete description of the securities, markets, or developments referred to in this material. Any information is not a complete summary or statement of all available data necessary for making an investment decision and does not constitute a recommendation. Before making any investments or making any type of investment decision, please consult with your financial advisor and determine how a security may fit into your investment portfolio, how a decision may affect your financial position and how it may impact your financial goals. All opinions are subject to change without notice in response to changing market and/or economic conditions. 1 The Dow Jones Industrials Average is an unmanaged index of 30 major companies which cannot be invested into directly. Past performance does not guarantee future results. 2 The NASDAQ Composite is an unmanaged index of companies which cannot be invested into directly. Past performance does not guarantee future results. 3 The S&P 500 Index is an unmanaged index of 500 larger companies which cannot be invested into directly. Past performance does not guarantee future results. 4 The FTSE Developed ex North America Index is an unmanaged index of large and mid-cap stocks providing coverage of developed markets, excluding the US and Canada. It cannot be invested into directly. Past performance does not guarantee future results. 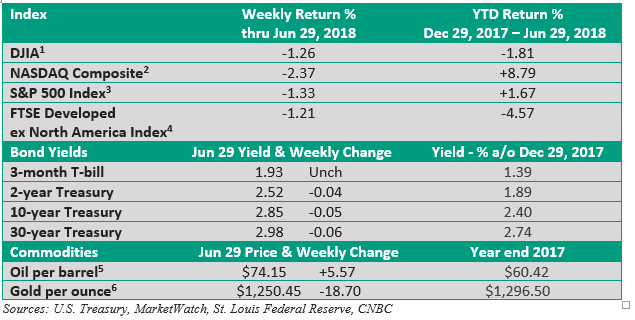 5 New York Mercantile Exchange front-month contract; Prices can and do vary; past performance does not guarantee future results. 6 London Bullion Market Association; gold fixing pricing at 3 p.m. London time; Prices can and do vary; past performance does not guarantee future results. Copyright © 2018 Financial Jumble, LLC All rights reserved.